Do you prize the look and authentic lines of a traditional Pipe Hawk, but have little use for the hollow bowl and the strength-compromised, drilled-out wooden "smoking" handle? Well here's a Pipe Hawk without those disadvantageous features. Precision forged from 1055 carbon steel, the Pipe Hawk offers a long, reasonably wide cutting edge and a solid, fully hardened hammer poll that's turned and ribbed to mimic a hollow pipe bowl. 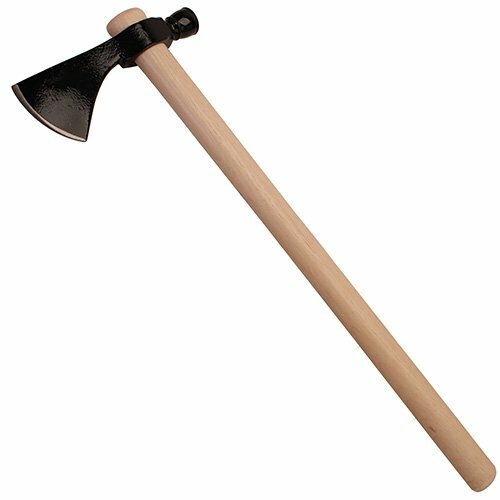 Fitted with a 19" hickory handle and weighing approximately 26 ounces it's heavy enough to be brutally effective as a chopping tool and weapon plus its solid bowl will drive nails, spikes and stakes with the power of a framing hammer.